HI100 High Incline Conveyor is used for steep inclined and vertical conveying. HI100 High Incline Conveyor provides the advantage of going up in significantly smaller space than traditional belt conveyor. 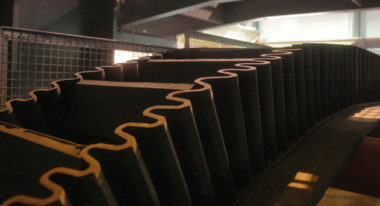 Sidewall belts have corrugated sidewalls and transverse cleats to provide pockets, which can carry all kinds of bulk materials from floury material up to 400 mm lumps. 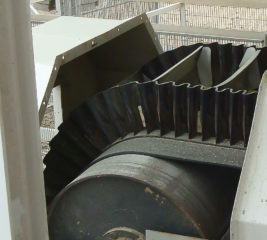 Sidewall belt has a cross rigid base belt, which can be deflected from horizontal to incline without bowing or sagging. As the stretch of the belt is minimal, take-up is typically screw type located in tail end. Our know-how of bulk materials handling is based on solid experience of various materials and all parts of a complete conveying system. Expertise has gained depth from thousands of references all over the world. Continuous product development has resulted in an exceptionally extensive selection of conveyor components and you will get all parts and services rapidly and effortlessly from the same supplier. Due to modular structure HI100 High Incline Conveyor can be quickly assembled at site. It is delivered in pre-assembled modules with main components installed. Modules can be packed in standard containers, which protect the equipment before installation and allow easy transportation to site. 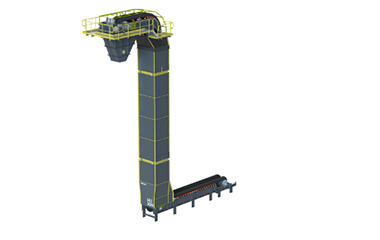 HI100 High Incline Conveyor is delivered with high quality mesh guards to allow safe use of the machine and visibility for maintenance. Standard delivery includes belt misalignment switches and rotation detector to protect sidewall belt. Emergency switches are included according to EN620. 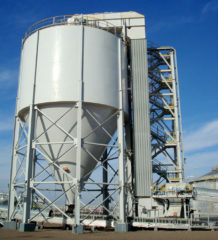 Chutes are available as options and include blockage detectors.